Good morning! Unfortunately, I was in need of a sympathy card, so I sat down to make this one over the weekend. A close friend of ours suddenly lost his mother. I kept this one fairly simple, using one of Mercy's fabulous sketches (MTSC43) as my layout. It's always hard to know exactly what to say on a sympathy card, so I used one of the sentiments from Verve's Forever in Our Hearts. 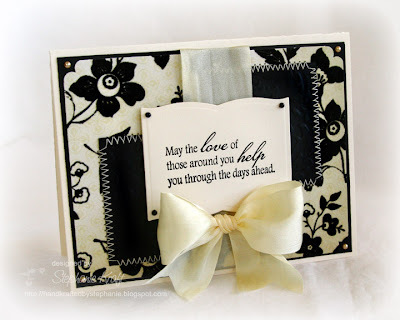 My patterned paper is flocked and I added some pearls and silk ribbon to finish off the card. Accessories: Labels Seven Nestabilities (Spellbinders), Damask embossing folder (Provo Craft), Scalloped corner rounder (Marvy), Pearls (Kaisercraft and Basic Grey), Silk ribbon (May Arts), Foam tape, Thread, Sewing machine. This is so pretty! I love the classiness! steph...this is so stunning! so elegant and exquisite! love the colors, the stitching, and that yummy ribbon!